"Earth Day is a great event for us, on a few levels" comments Marc McQuain, Volstrukt Co-Founder & CEO. "We talk a lot to customers about the strength and weight benefits of lightweight steel frames, yet spending the weekend at the Earth Day event brings a focus back on the sustainability benefits of building in steel." Volstrukt uses Framecad, the world's most advanced cold-form steel system, and applies this technology to create structural frames for small, agile spaces. "Steel is the most recycled raw material on Earth, so is obviously a responsible choice to build on," adds McQuain, "yet steel framing has been historically less understood and accessible to tiny and modular housing builders. We changed that by bringing engineered lightweight steel framing to this market three years ago." "The tiny house movement continues to embrace this methodology, and now that the movement is becoming a market, others are following our lead. We will see more and more tiny homes frames in lightweight steel." Steel is the most recycled raw material on earth, so is obviously a responsible choice to build on. Volstruk'ts lightweight steel production is also highly efficient creating less than two percent waste, all of which is recycled. 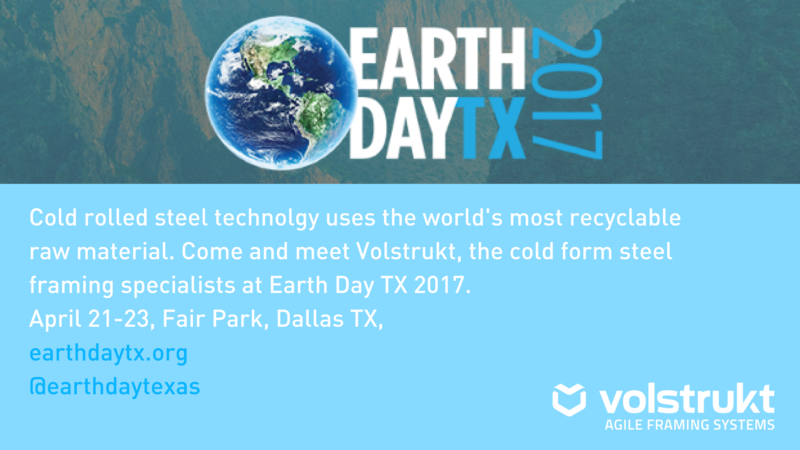 Volstrukt's Sales Director, Zac Siegler, will be on hand in Dallas to explain the Volstrukt offer and design process. "We will be displaying the 'Huka', our latest tiny house design, as well as a fully assembled, full-scale preview of our soon-to-be-launched modular housing range," explains Siegler. "The tiny house villages are an Earth Day highlight, given the tiny living movement's heritage in, and connection to the sustainability agenda and we are looking forward to meeting everyone in Dallas next weekend." Volstrukt's Earth Day show models are available for sale at the event, and all visitors are eligible for discounted purchases. To register your interest, or schedule a time to meet the Volstrukt team, sign up here. For Earth Day TX 2017 information and tickets, go here.